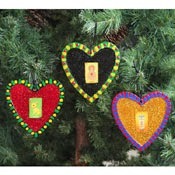 Leave the tinsel and give your Christmas tree sparkle with loteria ornaments. These easy ornaments are perfect for a crafting get-together near the holidays. Cover work area with scratch paper. Squeeze your favorite color(s) from the Crafty Chica™ Little Chica Paint Packs™ onto foil/paper plate. Basecoat the ornaments with paint and let dry. Cut out your favorite images from the Crafty Chica™ Loteria Game™ gameboard card and using Aleene’s® Original Tacky Glue®, glue one image onto each ornament. Pour Original Tacky Glue® onto foil, and using crafting brush, paint a layer of glue around the image. Pour your choice of glitter onto the glue and press with finger to set. Tap away excess onto scratch paper and return to container for re-use. Use your finger to add a thin coat of glue over the Loteria Game™ image. Mix the two-part resin according to package directions. Apply over entire ornament and let cure over night. Add painted accents around the edge of the ornament using your favorite colors from the Little Chica Paint Packs™. Let dry. Apply Crafty Chica™ Glossy Gloss Varnish™ to the outer edges and back of ornament to add shine. String ribbon through hole in ornament and tie.